A small, perennial wildflower, the common blue violet is the state flower in four states! Rhode Island, Illinois, Wisconsin and New Jersey have adopted this ornamental plant because of its beauty and prevalence in North America. A symbol of modesty and simplicity, the blue violet has long been used in traditional folk medicine, as it is rich in vitamins A and C, as well as antioxidants, including anthocyanin. In skin care, violets are reputed to help with oily and sensitive skin. Today we know that the leaves contain salicylic acid, which helps with oily skin, as well as has a moisturizing capability that works great for dry, sensitive skin. If you're looking for a natural source of salicylic acid—the ingredient often included in oily skin formulas —this is it! Mature plants are about 6 inches across and 4 inches high, with the flowers extending up a little higher than the leaves. The leaves themselves are oval shaped, and most have little hairs on them. Flowers are medium to dark violet, with the inner throat being white, and bloom from mid- to late spring. The root system has thick, horizontally branched rhizomes. As a whole, the plant likes partial sun or light shade and moist to average conditions, with leaves often turning yellowish when exposed to full sun. The plant is easy to grow and will adapt to various conditions, including lawns, prairies, open woodlands, and slopes along rivers or lakes. You may also see it in city parks and flower gardens. 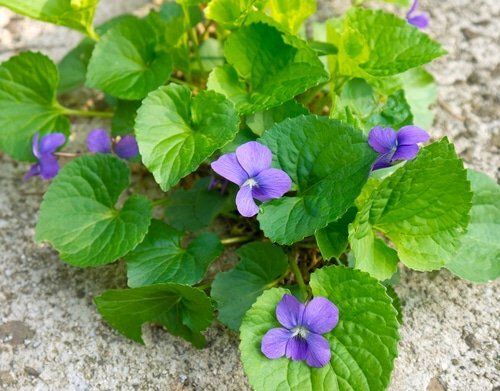 The flowers and young leaves of the blue violet are edible, and are often added to salads and soups, though they are reported to have a bland taste. Bakers use them as sugar-covered cake decorations. Dried leaves and blossoms can also be used to make a tea, which is said to be good for curing canker sores. Native American populations such as the Cherokee used blue violet to treat colds and headaches, while early botanists suggested it for coughs, sore throats, and constipation. In aromatherapy, practitioners use blue violet for easing the mind. It’s also recommended as a carrier oil for massage, because it’s light and moisturizing, and may be used in perfumes. Cleansing: Natural properties make this the perfect ingredient for oily skin formulas, as well as for eyewashes, mouthwashes, and other products made to help cleanse from dirt, oils and impurities. Salicylic acid: You’ll find this as an active synthetic ingredient in many oily skin formulas, but why not enjoy a natural source instead? Vitamin C: We know that this nutrient helps protect from environmental stressors and brightens the look of your skin. Vitamin A: Improves the appearance of fine lines and wrinkles. Natural oils and mucilage: These help hydrate and plump skin. Flavonoids: Protect against environmental elements. Saponins: These are phytochemicals that protect. Non-irritating, blue violet is great for all skin types, as it naturally hydrates while fighting oily skin. Have you used blue violet? Please share your experiences.